Ceci est une maison de trois étages de trois chambres sur le lac avec quai et de belles vues. La maison est louée entièrement meublée avec tous les appareils de cuisine, vaisselle et linge de maison, des outils, et laveuse et sécheuse. Le niveau inférieur a une cuisine, salon, véranda, chambre de maître avec salle de bain complète et une buanderie. Un escalier en colimaçon mène à l'étage, qui dispose de deux chambres, salle de bains et mezzanine. Maître a un lit king size, salle de séjour canapé est un divan-lit, chambre à l'étage a un lit queen, une autre chambre à l'étage dispose d'un divan-lit causeuse, et de la mezzanine a un lit double. Il ya une terrasse, barbecue et feu de camp en plein air. Il ya une cour établie avec beaucoup d'arbres d'ombrage. La maison est juste en bas de la rue du restaurant de poisson-chat de Vaughn. Ceci est une propriété sans fumée et sans animaux, à l'intérieur et à l'extérieur. Pas de camping en plein air est disponible. S'il vous plaît comprendre qu'il n'y a pas Internet fourni. Il y a la télévision pour que vous puissiez suivre la météo au besoin. Il ya deux salles de bain complètes, un rez de chaussée et un étage. La maison est située sur le lac Bob Sandlin, bien connu pour la pêche sportive, de conservation, et de l'eau. L'emplacement est rurale et paisible dans un quartier établi. Le gestionnaire vit à proximité, donc l'aide est facilement disponible. 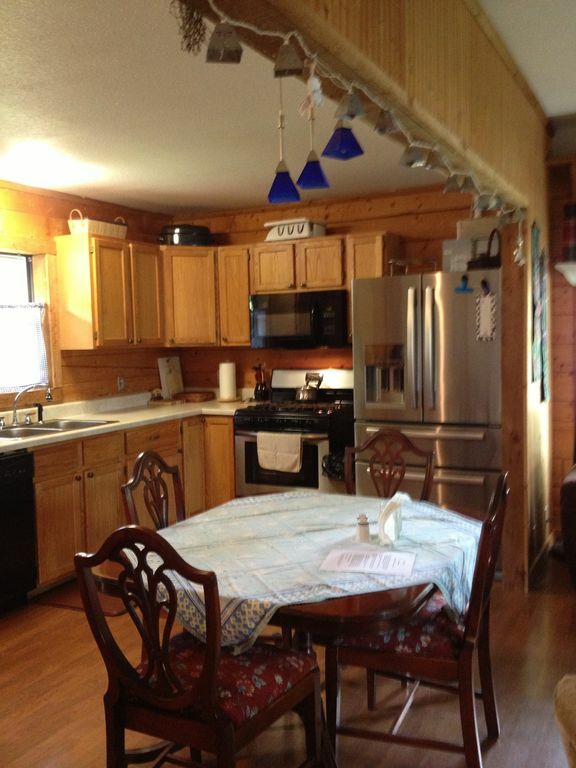 We enjoyed several days of peace and quiet in this cozy log cabin style home on the lake. Marsh mellows by the campfire and watching fish jump at the end of the pier made nighttime so peaceful. Accommodations were very comfortable and anything we needed or questions we had were only a phone call away. Definitely plan to go back in the near future. Wonderful location on the lake! My sisters and I rented this home for our mother's birthday weekend and it was wonderful! The house itself is beautiful with plenty of beds for everyone! The closed in porch is the perfect place for coffee and games...and the kitchen has everything you will need for your stay. It was beautiful and relaxing and just what we were looking for in a weekend getaway! Thanks. It sounds as though you had just the kind of experience we would wish for you! We had a fantastic stay! Absolutely no problems! The property manager was so kind and professional! The times we encountered him was very pleasant and sincere. We were also very impressed by how well everything was in great shape and fully stocked!! Great property rental through and through! Absolutely NO complaints, and we plan on going back soon!! P.S- The sunroom is AMAZING!!! Great location on big water on Lake Bob Sandlin. Comfortable and cozy log cabin. We spent 2 nights here with our grandsons. They loved the sleeping loft area upstairs. The home was comfortable and had everything we needed. The sun room was great for indoor meals and games. The back yard was large with plenty of room for kids to play. House manager was helpful with any questions we had. The deck was nice but would be nicer if it was covered. Perfect Home away from Home, Gorgeous Views! I absolutely love this log cabin house! You are right on the lake and there are stairs going into the lake for easy access for swimming. We tied our boat to the dock and it is right at the house! The driveway is a little narrow, so you can't park your boat and trailer at the house. But, right down the road there are several public boat ramps. They had literally everything we needed, even board games for the kids when the weather wouldn't cooperate. There is a gas grill, fire pit, and even a canoe to use, just watch out for any snakes that might be hiding underneath. Vaugns Catfish Restaurant is within walking distance and all the food is excellent, especially the hush puppies and Catfish. We brought toilet paper and towels, but they have everything there ready for you. The washer and dryer was a major plus! We enjoyed the sunroom too. I highly recommend this house. I'm already planning my next trip here. There is a $25 per night surcharge for holiday weekends. Prices are subject to change until booked. Check in is not available on Sundays. There is no Internet available.